What Caliber do I Need? Just a few lines to say Thank You. I purchased the 44 and 35 plain base dies over 2 years ago. I have made thousands of checks. Your dies have performed flawlessly. To tell the truth, I worked the Heck out of them. There are many shooters who appreciate your devotion and commitment. I know you have hundreds of raves regarding your checkmaker. I just wanted to add my 2 cents worth. I ordered a PB checkmaker a few years ago for my .357's and recently got one for my 44 mag rifles. I can't say enough about this product. 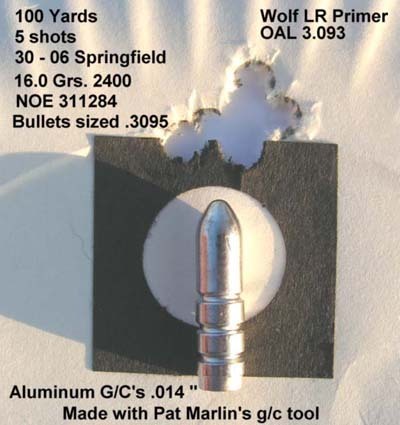 I just got a 44 cal 280 gr LFN PB mold from Veral at LBT and your checks make this bullet perform superbly in my Ruger 77/44 and my Henry 44 mag carbine. Accuracy is incredible with full house loads using a sweetened wheel weight alloy. I've included a couple of pictures of my checkmaker mountain dew bullets. Thanks for a great product. 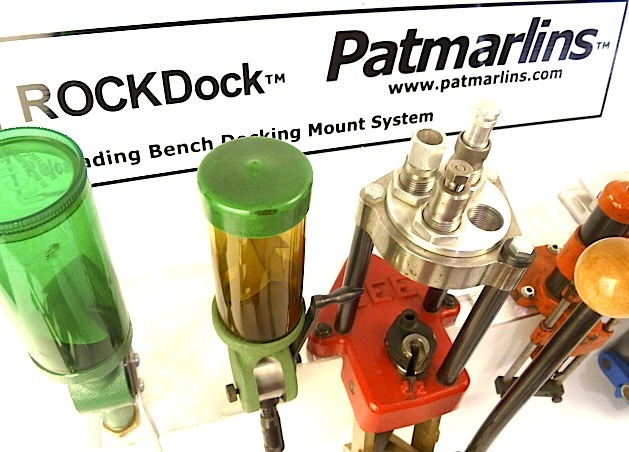 Patmarlins™... ROCKDock™ Reloading Bench Docking Mount System, allows you to choose and use any press instantly, without taking up your valuable reloading bench space. Why be locked into working with your reloading gear on expensive Elevated and limited bench mounts? The ROCKDock™ gives you flexibility and many choices. No tools needed... Set and regulate the slide in holding pressure you choose one time with installation. Install one or more ROCKDock™ docking mounts where you love to work most. 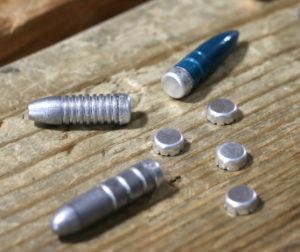 Next- order a ROCKDock™ base plate that is predrilled for each one of your presses. Grab the press you need- slide in and go. 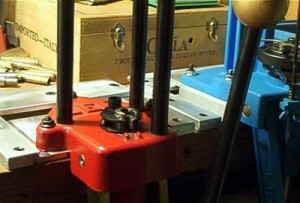 Store all of your presses on a shelf with SHELFDocks™. Free up bench space with a ROCK solid mount guaranteed. 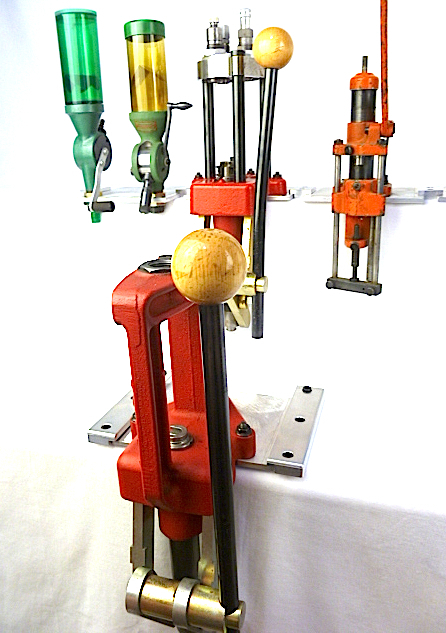 Whether you resize, swage, or for all around reloading needs. The ROCKDock™ is The lightest, strongest mounting system made and proven by 1000's of reloaders and cast shooters since 2008. Make your own quality gas checks and NEVER buy Gas Checks again! Meet or exceed accuracy shooting results of factory gas checks. Very user friendly - fast and easy to use, and to set up. 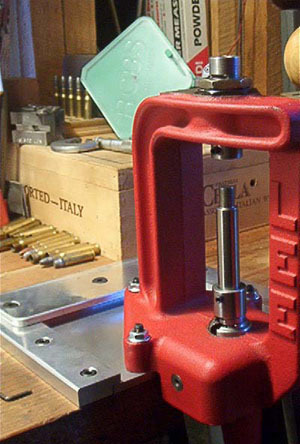 Produce concentric gas checks that fit and STAY on, using the accuracy of your reloading press. 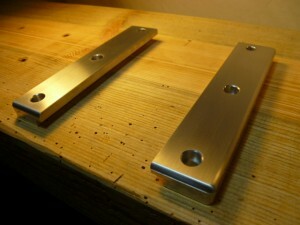 +/- .0005" Precision Heavy Duty machined quality with no moving parts to break or gum up. with a "No BS" warranty. Folks, I absolutely guarantee my products work as advertised, AND will work to your satisfaction. As always customer support is a TOP priority. Your order is guaranteed to be spot on and work flawlessly. I stand behind my products with the best of a "No Nonsense" warranty. 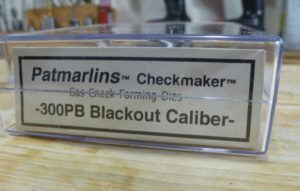 I have one of Patmarlin's 35cal PB check makers. I get my aluminum from soda cans. 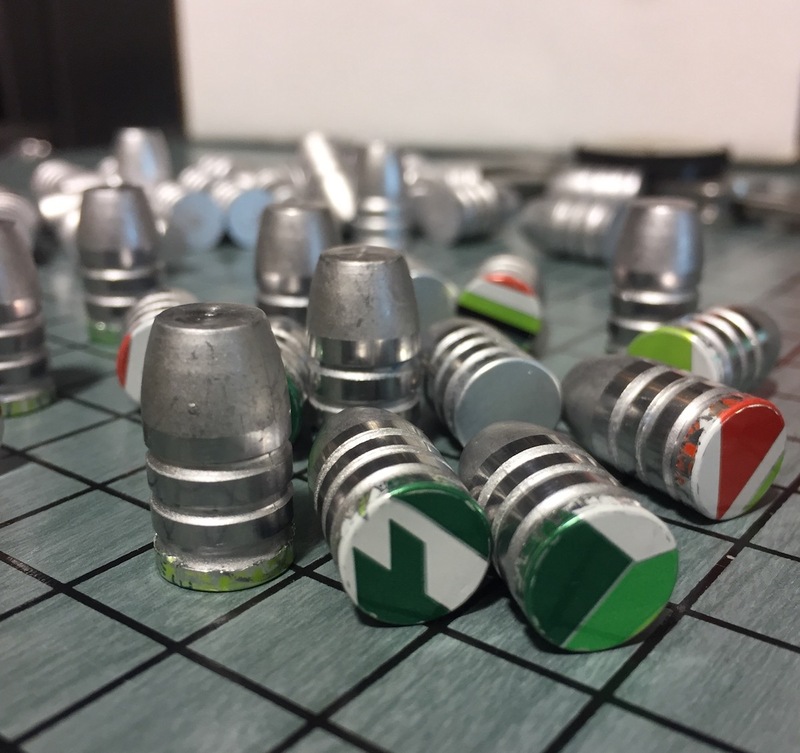 The die is ingenious, works beautifully and so do the checks. Your .30 cal Checkmaker has arrived today in Switzerland. 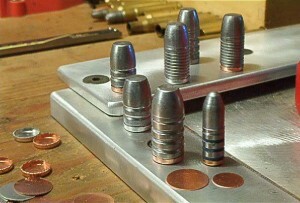 Works like a charm with 0.02mm (0.008") copper foil and the checks fit all my different .30 cal Lee & MP bullets. 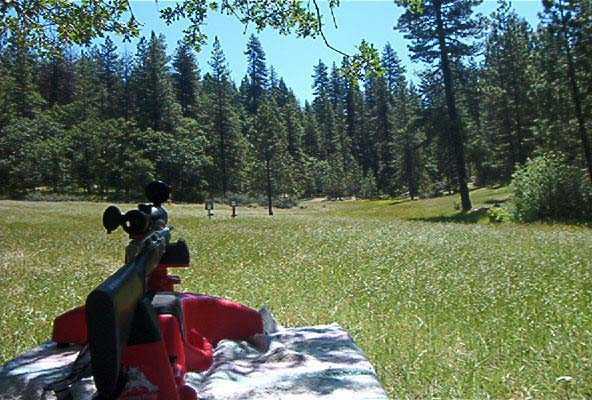 Looking forward to the results of my next range trip. I'm highly satisfied with your product, thank you very much! When you find the right thickness of Copper or Alu, they stay on well and match the Hornady, which are now priced away from my pocket."